The “Top 100 China B2B Enterprises In First Half Of 2018” was officially announced at The Third New Retail Supply Chain Conference hosted by 2B. On July 20, the “Top 100 China B2B Enterprises In First Half Of 2018” was officially announced at The Third New Retail Supply Chain Conference hosted by 2B. Allchips, founded in 2015, has been recognized by the market for its business model and industry experience. 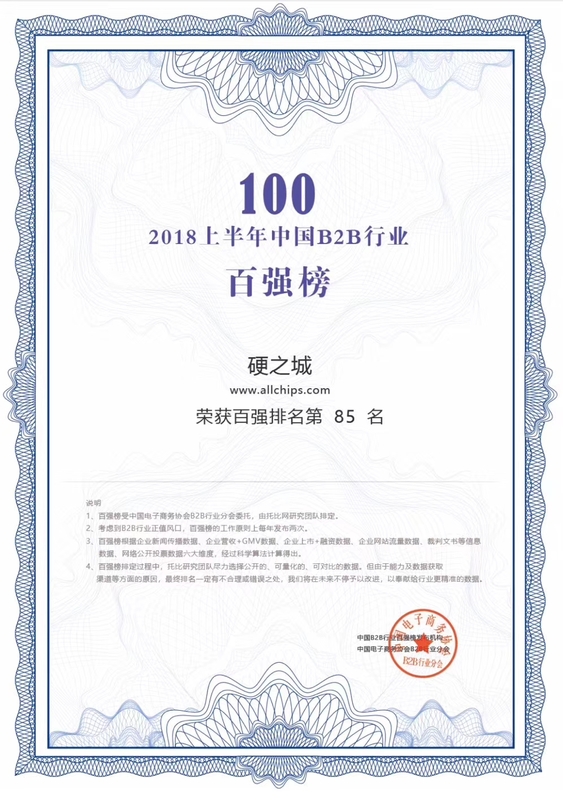 Allchips has won many industry awards in China; and three rounds of financing in 2016, 2017 and 2018. In China, Allchips’ BOM IN ONE BOX service has helped many small and medium-sized intelligent manufacturing enterprises, greatly increase their purchasing efficiency. At the same time, coupled with professional supply chain services such as import and export declaration, logistics, warehousing, finance, and rapid delivery, which have greatly reduced the purchasing cost of enterprises. The platform is a leader in the electronic components industry. In the future, Allchips hopes to bring this business model and Chinese Electronic Components to the world. Allchips is the supply chain service platform of electronic components. The platform combines big data and artificial intelligence technology, offering to calculate the cost, manage the risks, suggest alternative parts and complete the electronic components supply service of the BOM. So it becomes the second procurement department of electronic manufacturers, helping you complete manufacture plans, improve efficiency, save labour resources, time and components cost. BOM IN ONE BOX, is Allchips’ All-in-one Procurement Solution for Electronic Components. It’s also the supply chain tool aimed to solve your one-stop purchasing needs.